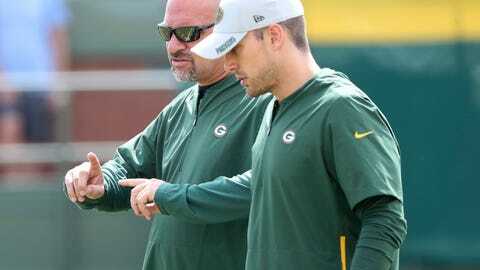 GREEN BAY, Wis. — As first-year Green Bay Packers defensive coordinator Mike Pettine installs his playbook, he’s got one of the best to deliver the daily tests: two-time MVP quarterback Aaron Rodgers. Through a week of training camp, Pettine’s defense is passing those early quizzes. By Pettine’s count, his defense has seven interceptions of Rodgers. Three came at Monday’s practice. “It certainly gives our guys some confidence,” Pettine said Wednesday, an off day for the team. “What a gift we have on defense to be able to go against one of the most elite quarterbacks to ever play the game. You talk about wearing ankle weights. That’s a tremendous thing for us, and for us to have that success, it’s a challenge for him. He’s not going against the same defense that he had gone against and maybe he got used to over years and years and years that he figured out. He’s still trying to figure us out, and there’s that element. Continuing that momentum will be the challenge as the Packers return to the field Thursday and look forward to Saturday’s Family Night practice at sold-out Lambeau Field. On Monday, two defensive starters, third-year safety Kentrell Brice and fourth-year inside linebacker Jake Ryan, suffered significant injuries. Ryan tore his right ACL and is out for the season. Brice appeared to have reinjured the right ankle that required season-ending surgery last year. At linebacker, the Packers will turn to Oren Burks, a third-round pick out of Vanderbilt who had taken some of the first-team reps from Ryan. Burks is one of five players on the depth chart participating in their first NFL training camp. The only remaining veteran is third-year starter Blake Martinez. At safety, Brice on Tuesday said he was thankful the injury “wasn’t as serious as it could have been.” Until he returns, the Packers figure to move forward with Josh Jones, a second-round pick last year. Brice is a pure defensive back and Jones, a combination defensive back and linebacker, so they bring different skill sets. That could force Pettine to make some adjustments if Brice’s injury lingers into the regular season.